You are here: Home / Church Talk / church growth / Is the Church too big to fail? Is the Church too big to fail? Oklahoma clergy have been assigned to read “Restoring Methodism ” by Drs. Molly & James Scott in preparation for a retreat with them in late September. Given that I was previously from a different area of the country, I happen to have attended the Scotts’ seminar before and am familiar with their arguments and recommendations. In re-reading the book during some idle moments today, I noted one argument that I’m unsure is valid. Restoration is the answer because it is unthinkable that God would abandon the institutionalized churches in America, as they compromise the vast majority – up to 90% – of the Christians in this country. I am unsure this as “unthinkable.” God has done this before. God had abandoned the Chosen People to decades of attrition (the 40 years post-Exodus), disowned the stubborn nations (Jeremiah 3:8), and allowed its assimilation into other cultures (Pharisaic Judaism v. Roman Hellenism). God also allowed the destruction of the Temple and the Jews found much meaning and refocus in the Diaspora that they wouldn’t likely have found otherwise. God has done this before, taken away what we thought was “too big to fail.” Can we really dismiss the horrifying thought that the Church as an institution has a time limit as well? Perhaps the Scotts meant that numerical decline is not in God’s plan for the Church. That’s a valid interpretation, I think. But Jesus had multitudes following him, was an icon for church growth…but after his hard sermons, he was left with 12. Failure, right? It was not unusual for Mr. Wesley to examine a Society with 800 members and leave them with 400 members. So it is OK for the institutional church to shrink but not be destroyed? 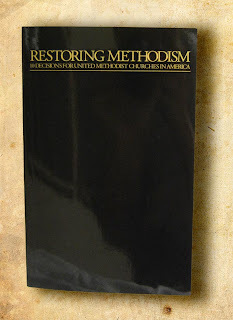 But isn’t restoring Methodism about reversing the shrinking trend? Huh. To be clear, I’m not advocating a burn-it-down-and-start-over reform…this blog would be called “Reformatting Christianity” if I did. I’m as committed to righting the institutional church as the next pastor. But I do have to assume that it could be God’s plan that the church burn to the ground and be risen from the ashes in a fiery Phoenix. And I have to wonder how best I could be an instrument of grace in the interim. God is sovereign. Let’s not place anything (even the unthinkable) beyond God’s possibilities, and seek instead to be instruments of God’s grace no matter what may come next. I have given much thought lately to the dilemma the UMC faces. The Church at large along with the UMC has not done a very good job conveying the message of Christ to the American culture. Most of those who see themselves as Christian or spiritual but not religious point to the church when asked why they feel as they do. With House Churches and non-traditional churches showing the greatest growth we have to ask ourselves: “Would it be better to close ineffective churches and redirect those resources into effective ministry and evangelism?” The question seems to answer itself. The problem is the responsibility the Church has to existing members unable to accept this change. I believe we have to have this difficult conversation in every congregation within the UMC. Lots of questions to answer. Lots of hard work to do. I almost think that we should burn it all down. Now, I'm Baptist by tradition, so take this with a grain of salt. But what if we did just kind of "melt" away into the shadows for a generation, working under the cover of regular society with the goal of reemerging later as a revamped program of very humble people? Seems to me that it might work. Unthinkable? That just means we can't think it. It's more about our limitations of imagination than about whether radical change is possible, even good. About survival/non-survival of the institutional church or the UMC: they may survive, or they may not. A line in an old Methodist liturgy was something like: "Dearly beloved: the Church is of God and will exist til the end of time." We have tended to jump to the notion that OUR part of the Church — or our way of being Church — will thus exist for the longterm. Phyllis Tickle's "The Great Emergence" would suggest we've been through several "unthinkable" changes already, and we're due for another "unthinkable" change any time now. I believe this: that for organizations as for individuals the quest to avoid death is deadly. Conversely, the willingness to accept death, or the risk of death, is life-giving. I'll stop short of saying it should be burned to the ground, but I will say that the institutional church seems to be more in the business of barriers than outreach. My favorite question, best asked in private, is this: if you had to choose between Jesus and this building, what would you do? Most of the time our budget answers that question for us. Here's a great song on what worship should be and how we might have lost our focus. The lines key for today are "jerk the pews and all the decorations too, until the congregation's few then hold revival." I think the old hand's knee-jerk refusal to imagine the world without the UMC is exactly the same as the (often) young person's knee-jerk enthusiasm for burning it all down and starting over. Those set in our ways resist change. Those rising into an established system resist tradition. The young see the old as lacking passion and commitment. The old see the young as lacking respect and wisdom. I'm using "young" and "old" here as types rather than denoting ages. You can be an 80-year-old young person. Both the young and old spirit bring gifts to the church. How do we best use those gifts is the question I find more interesting. We need all the gifts. If that's your assigned reading, seems to me you Oklahoma pastors have a leadership drag. I feel for you guys trying to pastor under that.